Buy Lakme Absolute Skin Gloss Gel Creme hydrate your skin for a healthy glow. Shipping Worldwide. Ships usually within 2 days. Didn’t you always desire for a perfect combination of nourishment and shine for your skin? Well, the wait is over. 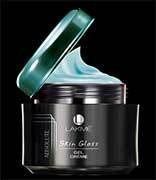 The Lakmé Skin Gloss Gel Crème is enriched with minerals to hydrate your skin for a healthy glow. Along with moisture for a soft, supple texture, it gives your skin a layer of flawless luster. A light glaze with mineral laden glacial water. Hydrates to make skin look radiant. Moisture coats your skin with gloss. Dab enter face with 5-6 dots of gel creme & gently pat till absorbed.